RENO, Nev. – After a surprise rain storm postponed last night’s scheduled game, the Sacramento River Cats and Reno Aces competed in a doubleheader Tuesday night. After a two and a half hour rain delay set back first pitch of game one, the River Cats finally got things under way, splitting the two games with Reno (L, 1-2; W, 6-2). Newly acquired Tommy Hanson (0-1, 4.50) made his River Cats debut in the opening game. Hanson struggled out of the gate, allowing three two-out walks in the first before escaping the bases-loaded jam. He finished his first Sacramento start going 4 innings, allowing 2 runs on 7 hits, walking 5 and striking out 2. Sacramento had chances to strike, loading the bases with two gone in the third, but a groundout to shortstop ended the threat. Finally, in the seventh and final inning of game one, the River Cats converted on a rally as with runners on the corners and nobody out, Carlos Triunfel grounded out to drive in Sacramento’s first and only run of the night. The River Cats finally got some offense going, as they struck for their first run in the fourth. With the bases loaded, Ty Blach helped his cause by hitting a sacrifice fly. Sacramento again loaded the bases in the fifth, and after a walk to Brett Jackson and a hit by pitch by Trevor Brown, the River Cats held a comfortable 3-0 lead. They added another run on an Adam Duvall sacrifice fly in the sixth, and two more in the seventh on a Trevor Brown RBI-double and a Darren Ford RBI-single. Blach (7-8, 4.21) kept to his winning ways on Tuesday, recording his second consecutive win. He allowed just 2 runs on 6 hits, walking 1 and striking out 5 over 5.1 innings of work. The late start had no effect on Blach, as the second game of the double header began at after 10:30 p.m. and ended early Wednesday morning at 12:55 a.m. 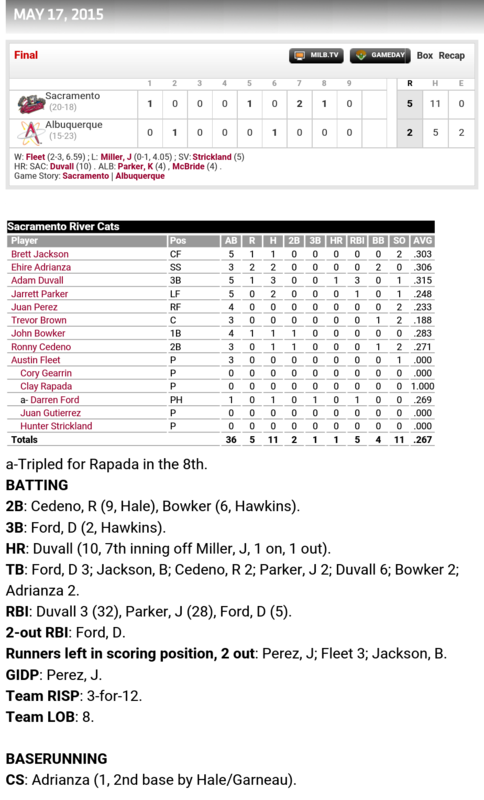 This was the first doubleheader the River Cats have played in the 2015 season. Last season, the River Cats competed in three, winning two and splitting one. The River Cats now head home to the warm weather of Sacramento to begin a five game series with the rival Fresno Grizzlies. The series will lead into the 2015 All Star Break, which occurs July 13-15. Pitching for the River Cats tomorrow will be right-hander Chris Stratton. Stratton is coming off of back-to-back 8 inning starts in which he allowed no runs and received no decisions in both. Opposing him will be Mark Appel (0-1, 10.38). 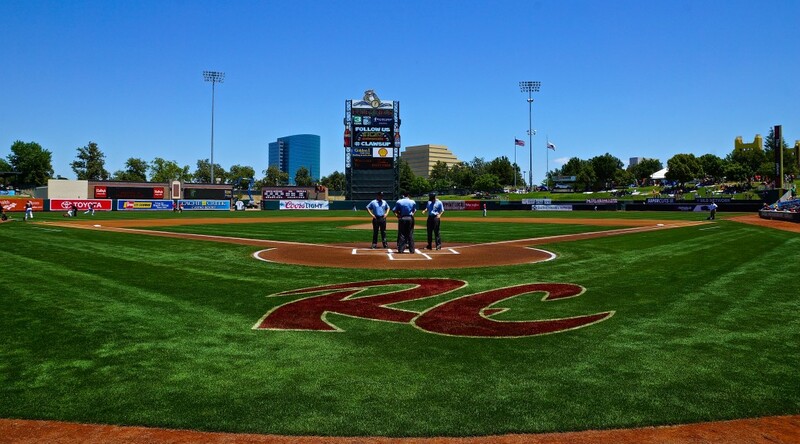 First pitch is set for 7:05 p.m.
WEST SACRAMENTO, Calif. – The Sacramento River Cats kicked off July with a thrilling 4-3 win in extras Wednesday night at Raley Field. After it looked like Jack Snodgrass was going to take the tough-luck loss in his first Triple-A start, a ninth-inning rally sent the game to extras where the River Cats won their fifth extra-inning contest on Adam Duvall’s walk-off RBI-single. With the bases loaded in the bottom of the 15th inning, Duvall came to the plate as the Salt Lake Bees brought in their centerfielder to go to a six-man infield. The move didn’t make a difference to Duvall, who stroked his fourth hit of the night to left field, bringing in Brett Jackson and sending the River Cats home with the 4-3 win. Overall, Duvall was 4-for-8 with two runs scored and two RBIs. For a while, it looked as if the game might not go that long, as Salt Lake held a 3-0 lead in the eighth. But Duvall sparked a late-game comeback with an RBI-double, giving Sacramento their first run of the night in the eighth inning. He scored two batters later on a wild pitch, cutting the deficit to one. Sacramento rallied again in the ninth, tying the game on a sacrifice fly off the bat of Ryan Lollis. Lollis, who went 1-for-6 on the night, extended his hit streak to seven games and his streak of consecutive games with an RBI to four. Before the offense rallied in the eighth, Snodgrass seemed doomed to take a tough-luck loss in his first start for the River Cats. Despite joining the roster on June 6, the tall left-hander was working exclusively out of the bullpen while Matt Cain and Jake Peavy were on Major League rehab assignments. In his debut as a starter, Snodgrass went 5 innings, allowing 4 hits, 1 run, and 3 walks while striking out 6. The bullpen was excellent tonight for Sacramento, throwing 10 innings of shutout ball. The group was headlined by Curtis Partch, who struck out six in 2.2 perfect innings. Brett Bochy went 3 innings for the River Cats, giving up just 1 hit and 1 walk while striking out 3. Before tonight’s game, Duvall was named to the 2015 Pacific Coast League’s Triple-A All-Star team. The right-handed corner-infielder has hit 16 home runs this season, good for second most in the PCL and all of Triple-A. He is also top ten in the PCL in games played (74), at bats (294), RBIs (51), and total bases (144). Ty Blach will take the mound for the River Cats tomorrow night. The left-hander is 5-8 with a 4.27 ERA in 15 starts this season and owns the league’s second best BB/9 (0.97). Opposite Blach will be another lefty, Salt Lake’s Adam Wilk (2-5, 5.14). First pitch is set for 7:05 p.m.
WEST SACRAMENTO, Calif. – San Francisco Giants right-hander Jake Peavy made his fourth rehab start for the River Cats tonight, throwing seven strong innings as he works his way back to the Giants’ rotation. Despite the solid outing for the veteran right-hander, the River Cats were unable to generate much offense behind him as they dropped game two to the visiting Fresno Grizzlies 3-1. Prior to tonight’s start, Peavy had failed to reach the sixth inning in any of his previous three starts. He threw 83 pitches in his last start in El Paso, but only managed to go 4.1 innings. He increased both his innings and his pitch count tonight, as he cruised through seven on a rehab-high 95 pitches (64 strikes). Peavy retired the side in order in seventh before giving way to the River Cats bullpen for the eighth. He ended his night having given up 5 hits and allowing 3 earned runs while walking two and striking out 5. Peavy allowed two runs in the first inning on a two-run double to Fresno’s L.J. Hoes before settling in. 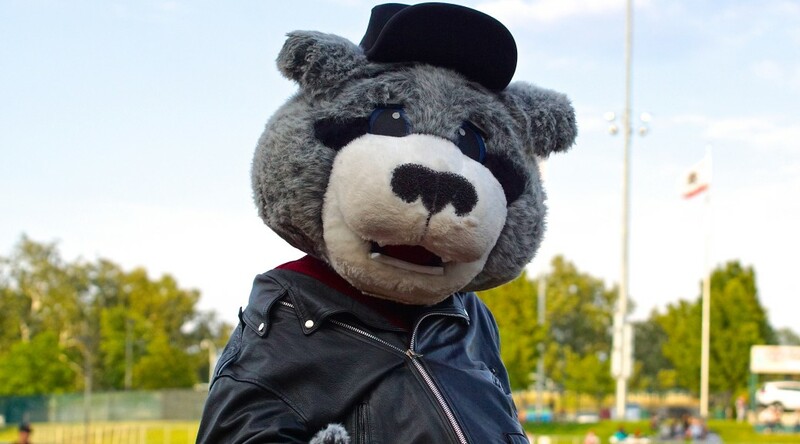 He kept the Grizzlies off the board until the fifth when the speedy Tony Kemp hit a long shot that bounced off the wall in right-center field. The ball shot away from Brett Jackson and allowed Kemp to come all the way around for the inside-the-park home run. After the hit by Kemp, Peavy retired the final nine hitters he faced. Despite Peavy’s effort, Fresno’s starter Asher Wojciechowski was better, holding the Sacramento offense to just 1 run on 5 hits over his seven innings of work. Wojciechowski only gave up one free pass and struck out 5 on his way to the win, his fifth of the season. He is undefeated through seven starts with Fresno. Tyson Perez pitched a scoreless ninth to record his fifth save. For the second night in a row, the River Cats fell behind early and were unable to recover. Their only run came in the bottom of the fourth inning. After Adam Duvall doubled to right-center, Travis Ishikawa brought him home with a single to right. Sacramento threatened in the sixth, putting runners on second and third with two outs, but Hector Sanchez struck out to end the inning. The series finale is tomorrow night as the River Cats send Chris Stratton (0-0, 2.38) to the mound. The start will be Stratton’s third with the River Cats and his first at Raley Field. Fresno will go for the sweep behind their southpaw Luis Cruz (3-2, 4.47). 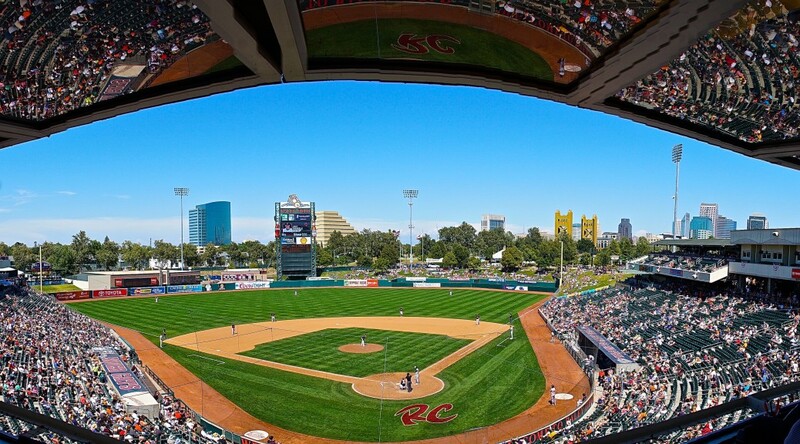 First pitch is set for 7:05 p.m.
ALBUQUERQUE, NM – The Sacramento River Cats took game two of the series against the Albuquerque Isotopes Sunday afternoon, 5-2. Adam Duvall led the way for the offense as Austin Fleet picked up his second win and second quality start of the season. Duvall went 3-for-5 with two singles and his first home run in nine days. With the 3 hits and 3 RBIs, Duvall notched his 13th multi-hit game and eighth multi-RBI game of the season, both of which lead the River Cats. Duvall’s homer was his 10th of the season, and he now has 32 RBIs. Ehire Adrianza also had a good day at the plate, reaching base four times as he went 2-for-3 with two walks and two runs scored. Austin Fleet pitched 6 solid innings, finishing his day having allowed 2 runs on 5 hits and 2 walks with 4 strikeouts. Both runs came on solo home runs, one by Kyle Parker and another by Matt McBride. He threw 87 pitches, 54 for strikes. The River Cats got on the board first with three consecutive singles, starting with leadoff hitter Brett Jackson. Duvall’s single drove home Jackson for a 1-0 River Cats lead. Albuquerque tied it up in the 2nd with a home run, but the River Cats answered back in the 5th. After Adrianza walked, he advanced to third on a Duvall single before Jarrett Parker knocked him in with a single of his own. Albuquerque evened the score with a home run from Matt McBride in the 6th, but Duvall’s two-run homer gave Sacramento the 4-2 lead. The River Cats added another run in the 8th when Darren Ford, pinch-hitting for pitcher Clay Rapada, tripled, sending John Bowker home. The bullpen pitched 3 shutout innings, combining for 1 walk and 3 strikeouts. Cory Gearrin and Rapada tag-teamed the 7th inning, and Juan Gutierrez pitched the 8th. Hunter Strickland closed out the game, picking up his fifth save of the season. He is now 5-for-5 in save opportunities. Game three of the series is set for tomorrow at 5:35 p.m. PT. The River Cats will start LHP Ty Blach (3-3, 3.40), while Albuquerque will counter with LHP Tyler Matzek (0-1, 63.00). Blach has pitched at least 6 innings in his last four starts and has a 1.82 ERA over that time. The game can be heard live online and on ESPN 1320 following the Rise Guys.